If you were a marketer following the Super Bowl on Twitter you may have participated in the AdBowl, BrandBowl, HashtagBowl, RTMBowl, or any number of other Twitter chats that were full of advertising commentary. The Seahawks may have dismantled the Denver Broncos (insert Sad Manning Face here) but what came up on TVs all over America aside from football were the Super Bowl commercials. More than ever, social media and traditional advertising are colliding and the Super Bowl commercials are no exception. This year, the hashtag became the call to action of choice, replacing URLs for one of the first times in recent memory. 45 commercials featured a hashtag but very few included callouts for specific social platforms like Facebook, Twitter and Instagram. Bud Light, Kia, Radioshack and a few other brands capitalized on this by running social ads to reinforce messaging on social channels during the game. 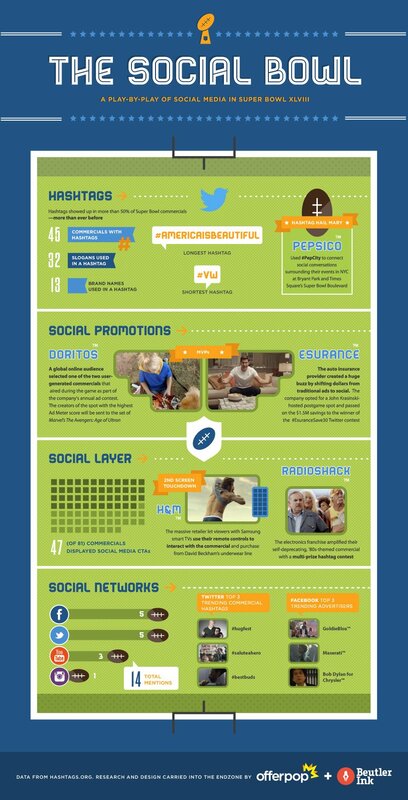 Check out this infographic examining this year’s social media influence in Super Bowl commercials! From the kick-off commercial to the 1.5 million dollar giveaway, here is a play-by-play from OfferPop.